Let me begin by saying, no, let me begin by stating, that maroon and gold are heinous. Hideous. Uch. And it’s certainly not a romantic gold. It’s not gold like Notre Dame. The ASU interpretation of “gold” is equivalent to what my urine looks like after I haven’t had a drop of water in a week and took down eleven multi-vitamins. Heinous I tell you, simply heinous. That said, I was in Tempe Saturday evening for the Wildcats’ dismantling of the Sun Devils. Wells Fargo Arena uncharacteristically loud – something changed. The rest of the way, the young Wildcats outscored the Scummies 67-38. No typo. Up in the far reaches of Wells Fargo us Wildcat faithful screamed and cheered and swore and smiled and danced. It was fantastic and it reaffirmed just how much I hate ASU. But now is not a time for hatred, so I’ll speak to love. 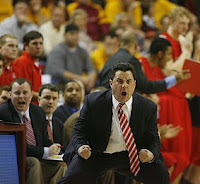 It was also reaffirmed for me just how much I love Sean Miller. That. Dude. Can. Coach. A team doesn’t shoot 51% (75% in the second half) on the nation’s top defense by accident. Sean Miller out-coached the ol’ Herb-ivore on Saturday. And I love that. For quite awhile there has been a “soft” label placed on the Wildcats. No longer the case. When Kevin Parrom fouled Ty Abbot on his dunk attempt, that was hard basketball (and later ruled flagrant, weak). When Ty Abbot got in Kevin Parrom’s face and KP smiled and laughed, that was just hard. KP’s twitter status immediately post-game read, “ASwho?!?!? I’m from Tha Bronx New York .. No Easy Buckets!! !” And I love that. The ‘Cats broke a five game slide to the Devils. Hadn’t beaten them in two seasons. 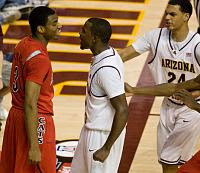 Before that, Arizona had won 24 of 25 against ASU. We beat them, in their house, by 19. And I love that. With five minutes remaining and up twenty, we took a lap around the rapidly emptying arena. You know, to make some new friends. It was glorious. And I love that. As we exited the usually barren Wells Fargo Arena (averages 49% of capacity) we engaged in some banter. The typically brilliant ASU “fan base” went straight to personal attacks. Adorable. But, in the midst of a game of hate ping-pong, our ASU counterpart looked right at our group and provided the line of the night, “Yeah, well our football team.” That’s it. He just stopped and then we began. And I love that. Our post-game meal was pizza. Wildcat fans had taken over the pizza joint and then three Sun Devils arrived. Each late-twenties and bearded, the dumbest of which decided to start chirping. Well during this round of banter, my brother says, “How smart can you be? You go to ASU!” The ASU response (which I am not fabricating or embellishing in any way), “I went to Columbia.” Wow. This genius was immediately berated with Andy Bernard quotes. The three beard-os walked out with their tails between their legs. And I love that. Our post-game drinks were at a dueling piano bar. Somehow, our group managed front row, center stage seats. When the playlist called for “Bear Down,” we killed it. For the second time that evening, a group of Wildcats owned the Sun Devils in their house. And I love that. The ‘Cats are rebuilding, sitting at 10-9 and 4-3. It’s not a great record, but as I’ve said before, perhaps ad nauseam, this program is on track and its Conductor is doing big things. And I love that. amazing :) wish i had been at the game. go cats! How bad is Pac-10 basketball this year?